The World Bank (IBRD, Aaa/AAA) today priced a dual-tranche transaction raising a total of USD 5.25 billion through USD 4 billion 3-year and USD 1.25 billion 7-year global benchmark bonds. The transaction was significantly oversubscribed with 145 total orders across both tranches, a total final order book of USD 6.2 billion and strong official institution, bank treasury and fund manager participation. The joint-lead managers for this global bond are Bank of America Merrill Lynch, Citi, Morgan Stanley and RBC Capital Markets. The 3-year tranche carries a semi-annual coupon of 1.000% and matures on October 5, 2018. It offers investors a yield of 1.058%, which is equivalent to a spread of 14.7 basis points over the 1.00% U.S. Treasury note due September 15, 2018. The 7-year tranche carries a semi-annual coupon of 1.875% and matures on October 7, 2022. It offers investors a yield of 1.894%, which is equivalent to a spread of 14.15 basis points over the 1.75% U.S. Treasury note due September 30, 2022. “We are delighted with the strong demand for this transaction. The dual-tranche approach served us well, allowing us to raise a large amount to fund our development programs, offer our core investor base the 3-year maturity which is in very strong demand, and deepen our presence in the longer end of the yield curve with the 7-year tranche. We appreciate the continued support from investors and comfort they take in World Bank bonds – especially during times of market volatility and uncertainty,” said George Richardson, Head of Capital Markets at the World Bank. The present transaction is consistent with the World Bank’s longstanding practice of deploying its franchise as an issuer in the international capital markets to offer investor’s high-quality, liquid instruments. This approach has direct benefits for World Bank member countries as well, since as a cooperative institution it is able to fund its activities as a provider of financial services to its members on highly attractive terms. “Once again, the World Bank has employed the dual-tranche strategy to great effect. The issuer’s ability to access diverse investor bases across both tranches is particularly impressive in light of recent market volatility. The transaction is an ideal continuation of their USD Benchmark program for 2015-16,” said Adrien de Naurois, SSA Syndicate at BofA Merrill Lynch. “IBRD has again demonstrated outstanding market access with this USD 5.25 billion dual tranche transaction. To achieve an issue of this size in these challenging markets is a phenomenal success and testament to the IBRD franchise,” said Philip Brown, Head of Public Sector DCM at Citi. “The USD SSA marketplace has been challenging since the end of the summer, and it needed a flagship issuer like the World Bank to reinvigorate it with a textbook transaction. This dual tranche deal demonstrated the World Bank’s continued appeal to investors across the curve, as well as its ability to dynamically and proactively respond to market conditions and investor feedback. The success of this issuance further underscores the World Bank’s continued pre-eminent status in the SSA universe,” said Navindu Katugampola, SSA Origination at Morgan Stanley. “Given the recent volatility we clearly needed that rare combination of high quality credit, precise timing and a bit of courage thrown in for good measure and the results leave no doubt as to the World Bank’s special ability to attract a high quality investor base – the World Bank team are to be congratulated for maintaining an amazing track record in the face of very uncertain markets,” said Jigme Shingsar, Head of US SSAs at RBC Capital Markets. The World Bank (International Bank for Reconstruction and Development, IBRD), rated Aaa/AAA (Moody’s/S&P), is an international organization created in 1944. It operates as a global development cooperative owned by 188 nations. It provides its members with financing, expertise and coordination services so they can achieve equitable and sustainable economic growth in their national economies and find effective solutions to pressing regional and global economic and environmental problems. The World Bank Group has two main goals: to end extreme poverty and promote shared prosperity. The World Bank (IBRD) seeks to achieve them primarily by providing loans, risk management products, and expertise on development-related disciplines to its borrowing member government clients in middle-income countries and other creditworthy countries, and by coordinating responses to regional and global challenges. The World Bank has been issuing bonds in the international capital markets for over 60 years to fund its sustainable development activities and achieve a positive impact. Information on bonds for investors is available on the World Bank Treasury website: www.worldbank.org/debtsecurities. THE developing world is catching up with advanced economies, but no longer as quickly as they would like. That has spooked investors. The slump in commodity prices and fears of an increase in interest rates in America led to 2015 being the first year since 1988 in which there will be a net capital ouflow from emerging markets. The IMF’s new World Economic Outlook, published yesterday, offers little comfort. Some of the IMF’s headline projections seem relatively chirpy. Despite deepening recessions in Brazil and Russia, the BRICS economies as a whole are still growing at a decent speed of 4.8% this year, and growth is projected to rise to nearly 6.0% in 2020. Last month Citi warned that a global recession led by an emerging-market slowdown is on the way; the IMF are positively bullish by contrast. In 2016 the IMF expects China to steam ahead at 6.3% growth, and India at a whopping 7.5%. But the IMF has been accused of over-optimism in the past, and they themselves admit that there are some big risks. One they highlight is the risk of a slowdown in emerging markets, coupled with investor panic. The IMF’s charts (see below) suggest what might happen in this scenario. 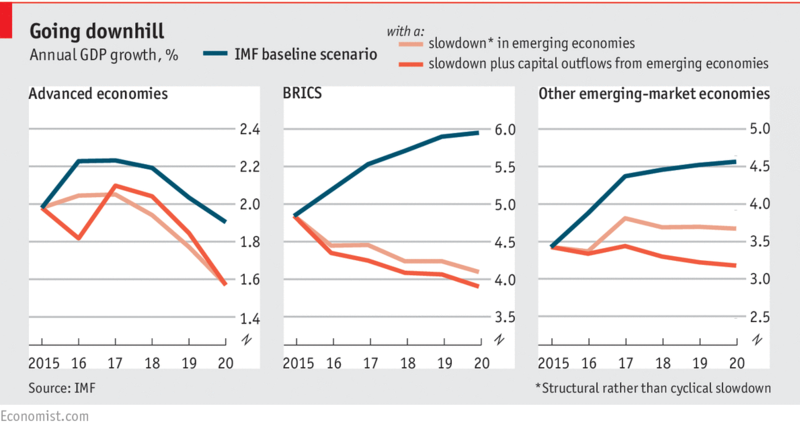 A four percentage-point drop in investment would slash growth in the BRICS economies (Brazil, Russia, India, China, and South Africa) from 6% to 4% by 2020. The IMF expects that the effects would spill over to the advanced economies, cutting growth by the end of the decade from 1.9% to 1.6%. If investors yank their capital from emerging markets along with the slow-down, then, as shown in the chart by the difference between the orange and red lines, the IMF thinks that in the very short run everyone would suffer even more. In other words, an emerging market slowdown will be uncomfortable; if financial-market panic about the slowdown increases, things will be much worse.